I found this recipe when I was going through my back issues of Cooking Light and determining which recipes to cut out and which to recycle. I've never made this before, but am glad it made it to the save pile. The only modifications I made to the original recipe (here) were to use 1lb each of the ground pork and ground turkey (ground turkey was 93% lean) so I didn't have random 1/4lbs of raw meat hanging around. I also used my little George Foreman grill inside since it was cold and rainy outside (today is May 15, I have friends snowboarding up at A-basin because they are still getting dumped on...crazy Colorado). 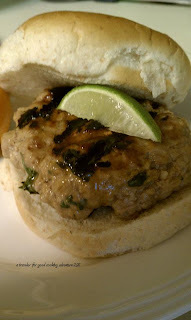 Whole wheat bun, a lime for garnish, a clementine on the side and we were good to go! Prepare grill. Combine all ingredients divide mixture into 6 equal portions (I ended up making about 9 because I had the extra meat), shaping each into a 1/2 inch patty. On an outdoor grill, grill 7 minutes on each side or until a thermometer registers 165. On my little indoor grill it was just 3-4 minutes on each side.